A bead is small decorative ornament pierced for stringing. Beads come in all shapes and sizes: round, cylindrical, square, tubular, triangular, amorphous and carved. They can be made of precious metal, gemstones, clay, plastic, organic material, wood, base metal, just about anything. Beads are strung in a line for necklaces, bracelets, and rings or suspended as pendants. Some of the earliest civilizations used beads for decoration, for trade, and as currency. They are also strung or linked together for religious purposes such as a rosary or worry beads and can be sewn on fabric in patterns to embellish a garment. Beads are probably the oldest, most versatile decorative item used by mankind. 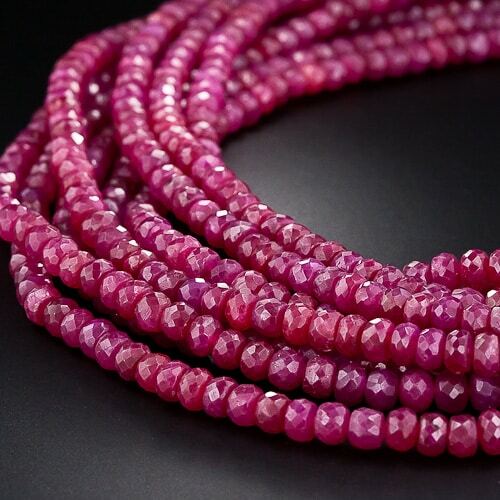 Ruby Necklace Composed of Nine Strands of Faceted Beads.